Dominating the Durance Valley, Pont Royal holiday village is pedestrian and spreads across 440 acres facing the Lubéron massif. A leisure area (Vallée des Loisirs) with giant slides, farm, and crazy golf sits in the 440 acres of greenery whilst 'Fantasy Racer' slides complete the water complex. Amongst the numerous activities available, golf is in the spotlight along with jazz events. The self-catering holiday apartments, houses and villas sport the region's typical architecture and capture the atmosphere and charm of a Provencal village with its main square, numerous restaurants and shops. Outstanding water complex: wave machines, river flumes, slides. 18-hole golf course and 6-hole Pith & Putt; new: Vallée des Loisirs (leisure area). Babies', kids' and teens' clubs from 3 months to 17 years. Pont Royal holiday village has a range of self-catering accommodation from 4/5 people studios to 4-bedroom houses for 7/8 people. There are two comfort ranges to choose from: Select and VIP. Please note: the sleeping arrangements on the upper level are unsuitable for children under the age of 6. Law no. 95 949 of 25/08/1995. In the Bouches-du-Rhone, between Alpilles and Lubéron, Pont Royal holiday village shows off its Provencal roots. The architecture blends in with its surroundings for a premium holiday. 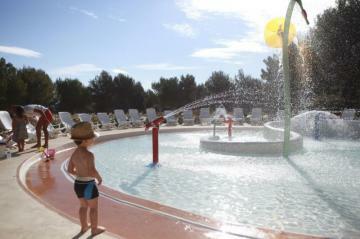 - Between Aix-en-Provence (30km) and Avignon (45km) and 60km from Marseille - Have you heard of the Provencal Colorado? The Lubéron and its ochre colours. - Discover the medieval and Renaissance history of Baux-de-Provence. For more information about these activities visit the village reception. 1 bedroom furnished with 1 double bed, 1 bedroom furnished with 2 single beds, 1 sleeping alcove furnished with a bunk bed.